Herb Peterson, the inventor of McDonald's Egg McMuffin, has died at age 89. His popular breakfast sandwich, which combines an English muffin, grilled egg, and cheese, has enabled McDonald's to maintain an enduring edge over its fast food competition. By Christmas of 1971, Peterson had been working on the product for months. he had experimented with prepackaged Hollandaise, which he rejected as too runny. He replaced it instead with a slice of cheese, which when melted on a hot egg produced the consistency he was looking for. He also had to develop a foolproof way of preparing an egg on a grill to give it the appearance of a poached egg. Poaching eggs did not fit with McDonald's assembly line production process, but Peterson solved the problem by developing a new cooking utensil--a cluster of six Teflon-coated rings--that was placed on the grill to give eggs the rounded shape of an English muffin. 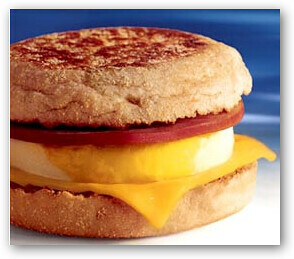 When he added grilled Canadian bacon, Peterson had a breakfast product perfect for a sandwich-oriented fast-food chain. In addition, the Egg McMuffin is one of the healthier items on the McDonald's menu with just 300 calories and 12 grams of fat. Petersen started out working at McDonald's advertising firm, D'Arcy Advertising, before eventually becoming a franchisee and opening six McDonald's restaurants in the Santa Barbara area.